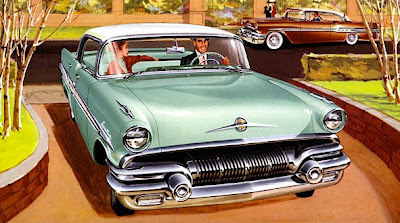 The 1957 Pontiac Laurentian four-door hardtop and (right) two-door hardtop. 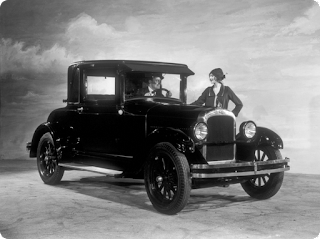 Canadians have loved Pontiac from its very beginning in 1926. The new brand from General Motors was tied to a First Nations theme, Pontiac having been a great warrior chief and brilliant war strategist in the 1700s. Colonel Sam McLaughlin, president of General Motors of Canada, helped kick off the new car by being photographed in the rumble seat of a new Pontiac introduced at public festivities. In case anyone should miss the obvious connection, the Colonel wore a full native head dress. 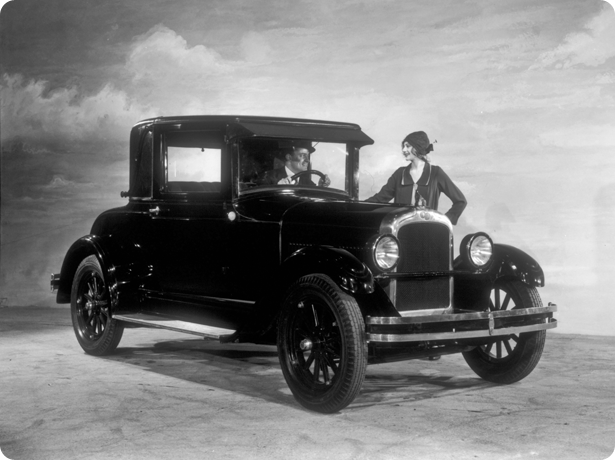 The new 1926 Pontiac was billed as "Chief of the Sixes." The new car was so much more popular than its Oakland companion that the latter was phased out of production at the end of the 1931 season. Oakland was built from 1907 to 1931. GM in Oshawa was quick to save money by having Chevrolet and Pontiac share chassis, engine and basic sheet metal. Automobile production was cut back after 1939, when Canada entered World War II and then suspended in 1942. After the war ended in 1945, Pontiac was one of the first brands to roll off the lines in Oshawa. Now sold alongside Buick, dealers were grateful to have something to sell as Buick did not re-enter the domestic market until 1951. 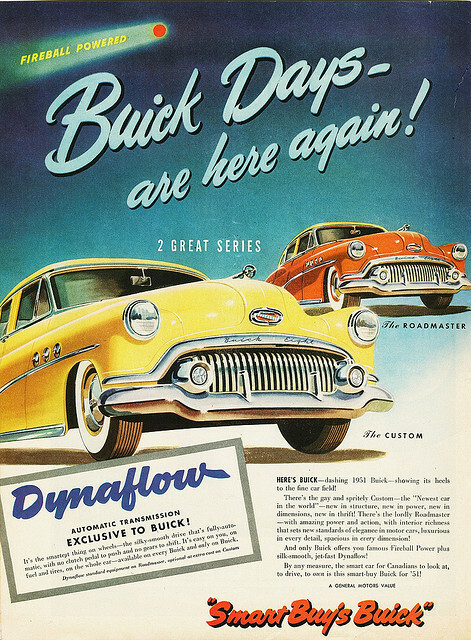 Once Ottawa had balanced the nation's wartime budget, Buick was permitted to return to production. In the mid-Fifties Pontiac suffered from the image of being a comfortable car for the more mature buyer and sales plummeted from third place in 1954 to sixth place in 1955. The 1956 Pontiac Laurentian was sold in the Union of South Africa as well as here at home. Pontiac made a heroic comeback in 1956 to capture third place and would claim it again in 1957 with a record-breaking 48,140 units build during the calendar year. It would capture second place in 1958 and go on to beat out Chevrolet for first place several years later. Semon (Bunkie) Knudson was determined to stop the disastrous slide when he took the helm of the Pontiac Division in the United States. He declared, "You can sell. a young car to old people but you cant sell an old car to young people." One of the first things he did was order the the twin silver streaks--a sacred Pontiac styling cue--ripped off the hood. He ordered Pontiacs onto the race circuit with terrific results. Canadians loved Pontiac and Knudsen would rekindle America's love affair with Pontiac, too. The 1957 design was a reskin of the 1955 body shell. Ad copy called it 'Star Flight' styling. For Canadians this meant a Pontiac body shell reduced to fit on the smaller Chevrolet chassis. Regardless of the name in 1957, styling was loaded with aggressive, warlike looks. The front was more massive and laden more chrome than ever before. Bomb-shaped bumper guards flanked the vertically-fluted grille. Sides were graced with tasteful, full-length moulding that carried the lethal-looking missile theme. The sides contained a smart dip in the rear quarter panel to give the illusion of a fin at the rear. The backside of the Pontiac was in similar taste, resembling the rear of a jet fighter plane. A broad oval tail lamp protruded from a generous chrome housing set in a reverse--cant fender cutout. The oval was repeated in the bumper's dummy exhaust pot. 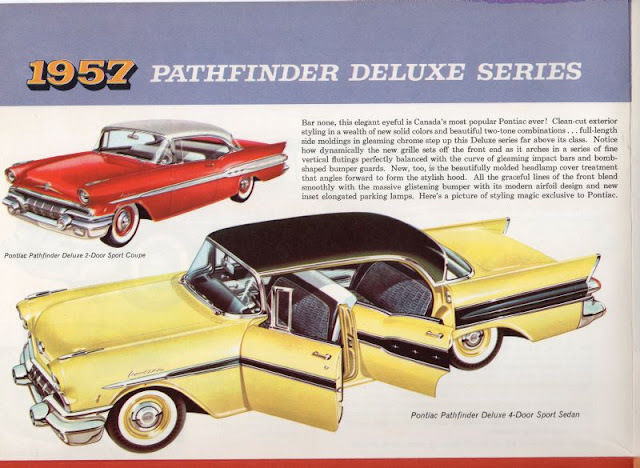 While American brochures liberally employed war and weapons terminology to describe styling, copywriters for Canadian line folders wrote a completely different story, bragging about the styling magic of Pontiac and extolling its clean-cut exteriors and graceful lines. 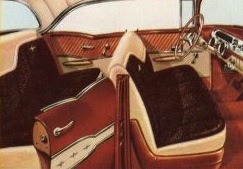 The casual elegance of Pontiac's interiors was referred to as "over the shoulder" styling. With all the hoop-la around the design changes, Pontiac's mechanical side got plenty of attention, too. 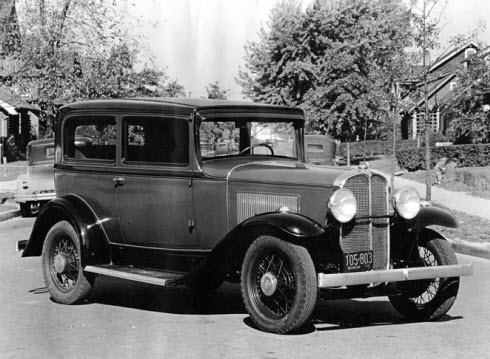 A new chassis gave Pontiac a lower centre of gravity and greatly improved roadability. Wheels got 35.5-centimetre (14-inch) diameters. Rear springs were widened to reduce lean when cornering. Front suspension was redesigned and Powerglide automatic transmission was introduced as an option. 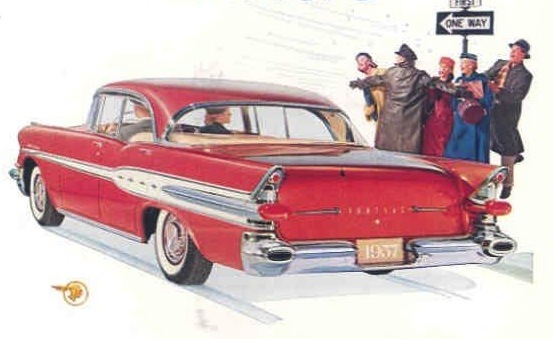 Pontiac-Buick dealers offered Pontiacs in sixteen body types in three lines for 1957. The luxurious Laurentian, popular Pathfinder Deluxe and economical Pathfinder series were sharp to look at and fun to drive. A full year ahead of our American cousins, Canadians could order fuel-injected power plants to stuff under the hood. 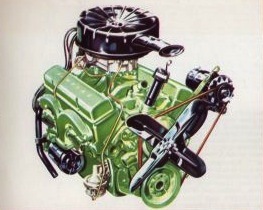 Upon special order, GM would whip up a maximum performance package with competition-type camshaft, high-speed valve system and mechanical valve lifters for the 270 (4.4-litre) and 283 (4.6-litre) Power Chief engines.